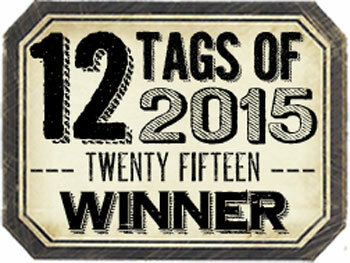 July Tag - Tim's 2015 Tag Challenge. I admire how patriotic the American's are and how they love their 4th July celebration.... and why not, it's a fabulous excuse to take time out to all come together and enjoy life. We Brits only do that at Christmas and whilst that's a magical time of the year, it's also rather manic to say the least. Maybe we should adopt the 4th of July too? Because I struggled with this tag I gave up taking pictures along the way but there are a few close ups of the various elements. I started my tag pretty much as Tim did but I used a couple of pages from a very worn (and much loved) copy of Brideshead Revisited by Evelyn Waugh (quintessential British), which I "tweeted" to get the title at the bottom of my tag. The Union Jack I actually used on the tag was my THIRD attempt at getting it right.... I had no idea just how hard it would be to create a Union Jack flag and please don't look too closely, the spacing still isn't right. Here are all three of the elements hand-drawn on to watercolour card and ready for colouring up. I used SU Real Red and Pacific Point markers from my stash.... the Ranger Distress Ink Markers are on my Christmas wish list (fingers crossed). For the backgrounds I used Fired Brick, Faded Jeans and Pumice Stone Distress Inks and for shading I used a light grey FC Big Pitt Brush pen. I really like the versatility that the new Distress Micro-Glaze offers. However I was a tad too generous when I applied it and ended up with a little too much of the background card when I used the glaze on the letter element.... Note to self: a little goes along way with this product. I only have Frayed Burlap as a Distress Stain so I use this to edge my tag and the three elements... BIG MISTAKE... HUGE! Obviously the watercolour card soaked up the Distress Stain like a sponge.... if I'd thought about it first I would have known but it was too late. Happily though, I was light handed and I toned down the soakage with a touch of Picket Fence Distress Stain (this has to be the most used product in my stash...fabulous) and for the first time since starting my tag I began to like it. finally it felt like it was beginning to come together from the dire mess that initally appeared on my craft sheet. Liking the look of the Frayed Burlap and Picket Fence I repeated the same treatment on the distressed edge of the tag itself. Why the image of a dog? Well, he's a British Bulldog. I decided to pop a little crown remnant rub on his head to cheekily represent royalty. Just sneaking out from the background there's a reference to Lincoln's Inn and Torquay, both special places for me in the UK. Lincoln's Inn because it's the quintessential seat of law in England and Torquay because I use to holiday there as a child with my parents each year. There are a few more Remnant rubs dotted around the tag.... another crown (well, we have plenty of royalty), a postmark and a postcard to represent our iconic GPO and three stars to represent England, Scotland and Ireland. Like Tim I coloured my ribbon with red and blue markers and watched them bleed into the white seam binding... great fun. I used a Ranger Word Token, and similarly used the word brave which I wanted to represent our brave heroes in the forces. Behind is one of the charma I make for each of my tags each month using Tim's logo (couple of bubbles in the Glossy Accent.... oooops!). Both secured in place to the ribbon with a Ranger Garment Pin . You might have spotted the Ranger Word Band or Philosophy Band (sorry, not sure what they're called) at the bottom of the tag. I printed off a famous extract from the hymn, Jerusalem on my PC and edged the card with Walnut Stain Distress Ink before tying it in place on the tag with some thinned out garden twine. I also went round the entire tag with the same coloured DI to pull it all together before stitching with a single line of dark brown thread. Finally, this is the back of my tag; I like to print off a picture of Tim's tag each month and mount it on the back so that I can see where my inspiration has come from. I also like to back my tags because it gives a nicer, un-messy finish to the tag... et Voila. As I mentioned, this tag fought me through the whole creation process... maybe because I was trying to get it completed in an evening instead of letting it evolve over a couple of nights, as and when I've got time, as I usually do. Who knows? But what I do know is that I persevered and now, I actually like the end result and am happy enough with it to post it to Tim's blog as my entry for this month. Thanks for taking time out to visit my blog... have a wonderful time crafting. Enjoy. OMG! I just love what you did with this! The dog is wonderful and I am thrilled that you drew your own "stamps" here. I thought about doing the same thing, and am inspired to do so next time! I love, love, love this tag! carol I LOVE your tag! The bulldog is amazing!